This is a Rhythm Review Week. Please sing all four of our terms’ songs: Hot Cross Buns, The Boatman, Hop Old Squirrel, and The Closest Key. Then do the Rhythm Activity. If you don’t have an advanced student exercises will be provided for you. Advanced extension – Your Advanced Student’s lesson will be used for the family lesson this week, so please have them do their assignment first!! Please watch this video to check yourself and see how you are doing with sight singing exercises 17-19. This week’s Advanced Lesson Assignment: MUSICAL COMPOSITION – Rhythm Review with your family. Write a few Rhythm exercises with only quarter notes and eighth notes and have your parents or younger siblings read the rhythm’s to you using their rhythm syllables. Du= quarter note, Du De is what you say for 2 eighth notes. Try using 2/4, ¾ and 4/4 time. If you need help see the image below under part 2 for suggestions. Part One Family Activity: Review All 4 Songs with us! Please sing all four of our terms’ songs: Hot Cross Buns, The Boatman, Hop Old Squirrel, and The Closest Key. 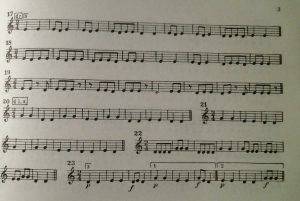 If you have an Advanced Student, please use their compositions to practice reading their Rhythm Exercises instead of the ones I have written below. They should have written Du or Du De ( Quarter and eighth notes) only. If you don’t have an advanced student, then some exercises have been provided for you below. If you have intermediate students, they also might be able to make up some rhythm patterns for your family on plain paper! Give it a try! Please look at this online or print the image off and have your children follow along with their finger and try to say the patterns. If you have young children and this is too small, feel free to write them larger with a marker on plain paper so they can see them better. You can copy from this image. You do not need to include the Staff lines and bar lines. You can just write the notes. I have provided an example in a video as well. If you had an advanced student write you an exercise or two, use those instead or along with this one.